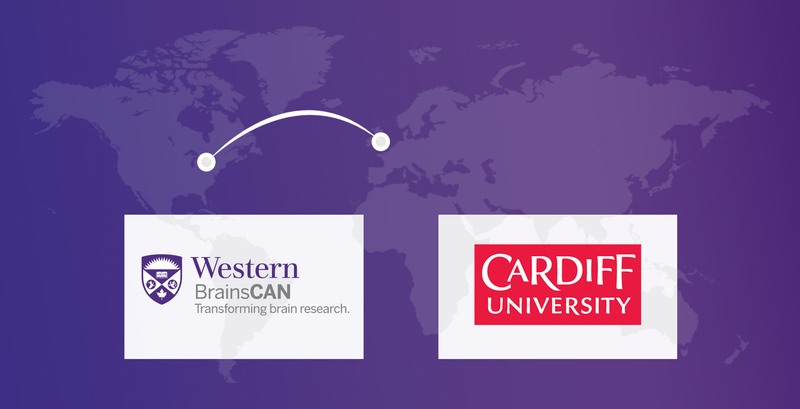 BrainsCAN, Western University’s neuroscience research initiative, is continuing to expand its global presence with a new memorandum of understanding (MOU) with Cardiff University in Wales, UK. Through this MOU, BrainsCAN and Cardiff researchers will build collaborative, high-impact neuroscience research projects to develop and deliver evidence-based assessments for the diagnosis and treatment of brain disorders. As part of this partnership, BrainsCAN researchers will have the opportunity to work closely with Cardiff researchers to share expertise and resources. Postdoctoral fellows and students from both institutions will also benefit from increased exposure to world-renowned principal investigators from Western and Cardiff. This is the third research MOU BrainsCAN has established since its inception in 2016. Other MOUs have been signed with RIKEN Centre for Brain Research in Japan and Yonsei University in South Korea. BrainsCAN’s continued global partnership expansion formalizes collaborative research projects between BrainsCAN and institutions around the world. This expansion ensures that BrainsCAN researchers can broaden their work globally, generating world-leading research projects on brain disorders and diseases. The BrainsCAN and Cardiff partnership officially begins January 2019. Opportunities for BrainsCAN-aligned researchers to connect with Cardiff will be posted on BrainsCAN’s website when available. For further information, please contact brainscan@uwo.ca.